4 - 3.............Palma von Ellendonk. 4 - 3.............Dascha von Forell. 5 - 4.............Miko von Fürstenfeld. 5 - 4.............Iris von Ellendonk. 4 - 5.............Ralf von Forell. 4 - 5.............Asta von Fischweiher. 1991: 100-94-95 = 289 points. 05/09/1993: 100-92-95 = 287 points (4th). 28/03/1992: 100-94-93 = 287 points. 10/07/1993: 97-94-95 = 286 points. 18/05/1991: 99-92-84 = 275 points. 20/04/1991: 96-87-84 = 267 points. 1990: 100-94-95 = 289 points. Gina von der Weyermühle passed the ZTP with high rating for protective instinct, fighting spirit, courage, hardness and very high self-assuredness with middle sharpness. Gina lived to 8½ years of age and passed away from cancer. Her dam and sire both passed the Körung 'for life' while her dam, Anouk von der Weyermühle, competed at the D.V. Meisterschaft in 1986 and 1987. Gina's brother, Gero, passed the Körung 'for life' with highest rating for working drives and at his ZTP the judge commented on his exceptional character. Ilo: SchH 3, FH and passed the Körung at two years of age with highest ratings for courage and working drives. He is sire of the vom Blitzkrieger “B” litter (Baron, Bogart, Bella, Bo, Bren); von Warringhof “N” litter (Noami); Jotunheim's “H, P, S” litters (Hamlet, Hildico, Hergerd, Pegrim, Signe) and vom Tanzenhaus “A” litter (Angriff, Andie). Indra: SchH 3 and passed her ZTP with 1B rating for character and G for conformation. Ira: SchH 3 and passed her ZTP with 1A rating for character and SG for conformation. Kent: IPO 2 and passed her ZTP with 1B rating for character and SG for conformation..
Kleo: German Police K-9, SchH 3, FH, IDC-Weltmeister and passed the ZTP with 1A rating for character and SG for conformation. 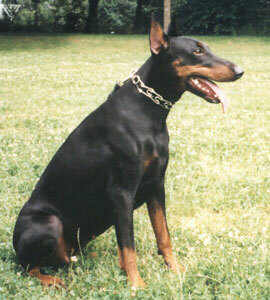 She is dam of the von der Doberwache “A, B, C” litters (Amatzon, Bronco, Bastian, Bingo, Brista, Branca, Bonny, Biene, Chico). Mannix: German Police/Narcotics Detection K-9 and sire of the von der Urftquelle “A” litter (Alfred, Apollo). Mona: SchH 1, ZTP SG 1A and passed the Erstkörung at two years of age with Körklasse 2B rating. Nero: SchH 3, FH and passed the Erstkörung at two years of age with Körklasse 2B rating. He is sire of the von der Burgstätte “B” litter (Baghira).